Finally, a system seller with something viable. Laurence Scott offers two main methods to beat roulette: visual ballistics and wheel bias analysis. Visual ballistics is where you visually determine where the ball is most likely to land. Bias analysis is exploiting physical flaws of wheels. 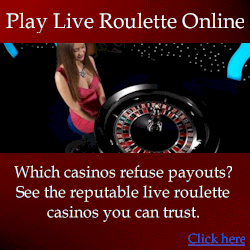 Both techniques are indeed a valid method to beat roulette. In fact everything Laurence teaches is already part of my course. Laurence’s package overall is about exploiting physical flaws of roulette wheels. His material is well presented and reasonably easy to follow, although the video footage used for practice is very poor. His techniques are indeed valid, although the problem is they are very old, and can only realistically be applied on older wheels with strong flaws. That is not to say such wheels don’t exist today, they are just very hard to come by. Laurence is probably best known for his “crossover” visual ballistics method, while is extremely impractical and very difficult to master. For it to be both effective and practical, the wheel needs to be physically flawed, the ball needs to have very little bounce, and the wheel rotor must spin very quickly. In particularly because relies on a fast rotor, which inevitably causes more erratic ball bounce, I consider it quite poor. However, his latest material releases use an acoustic technique to replace the crossover method, which is more plausible – it relies on hearing the ball’s sound to determine remaining drop time, and make predictions. However this acoustic method is only possible on very few wheels that exhibit particular properties, and only if the casino environment is not too loud. Michael Barnett (a casino consultant) conducted a study of Laurence’s acoustic method. Michael believes the acoustic method to be nonsense, although he failed to take into account the conditions in which it’s a viable method. In this case, Mr Barnett is wrong. Basically if you find a wheel where the ball suddenly decelerates, the acoustic method is viable at least for approximating the ball speed (without consideration to other elements of ballistics methods). This kind of condition is more common than perhaps Mr Barnett realizes. But this alone does not make a wheel a viable candidate for such strategies. The “biased wheel report” component of Laurence’s material is quite good, but again it relies entirely on physical flaws of roulette wheels. While in fact there’s no such thing as a perfectly random wheel, and every wheel is biased to a degree, very rarely is a bias alone strong enough to enable long-term winnings. Perhaps 1 in 500 wheels in modern casinos may be biased enough. 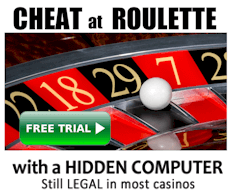 And even if a biased wheel is found and exploited, casinos quickly replace them, limiting profits. There is still the opportunity to bet big on a biased wheel before the casino replaces the wheel, but finding the wheel itself takes more time that it’s worth. VERDICT: Laurence Scott’s techniques do work, and they would have been great 15 years ago, but not in today’s casino. His techniques rely on conditions and roulette wheel flaws that are far too hard to come by. To be successful with his techniques, you must be prepared to spend a lot of time and resources to find the right wheels. Because the required wheels are so rare, and exploited wheels are quickly replaced, these techniques are not realistically financially viable in today’s casinos. I have communicated with Laurence numerous times and find him to be a sincere and pleasant person. I think he is aware his techniques don’t have the same effectiveness as say 20 years ago. But at least he doesn’t claim otherwise. It is not to say that suitable wheels still can’t be found.